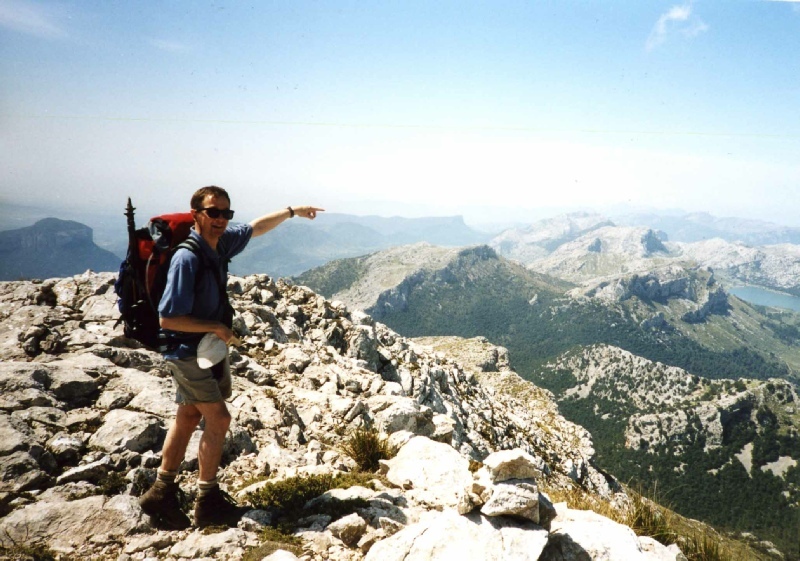 The Sierra de Tramantuna, the main mountain chain in Mallorca, lies along the North-West coast and reaches heights of over 1000m. 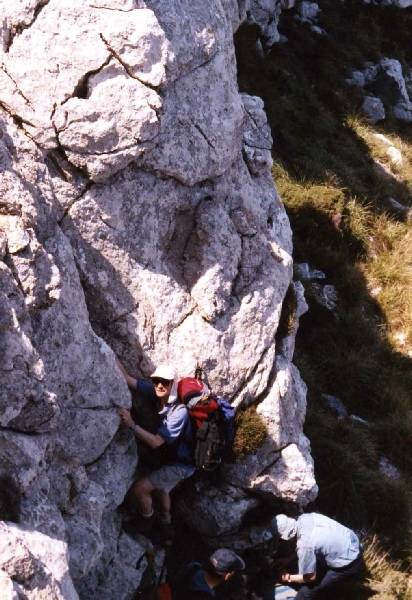 Many of the mountain tops are almost bare of vegetation and the hard, rough limestone gives excellent walking and scrambling. There is varied flora including evergreen forests, maqui and sub-alpine flora on the approach to the peaks. 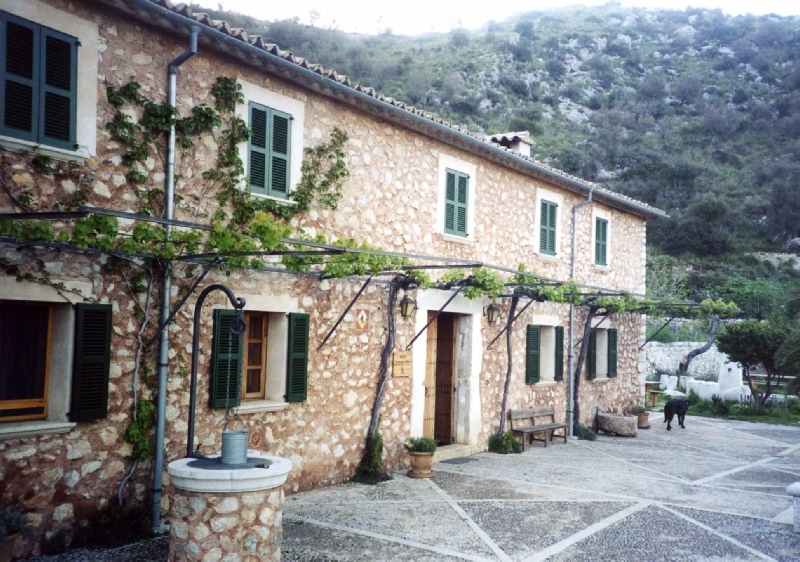 The route chosen covers all the high peaks of Mallorca and roughly follows the pilgrim route from Soller to Lluc. 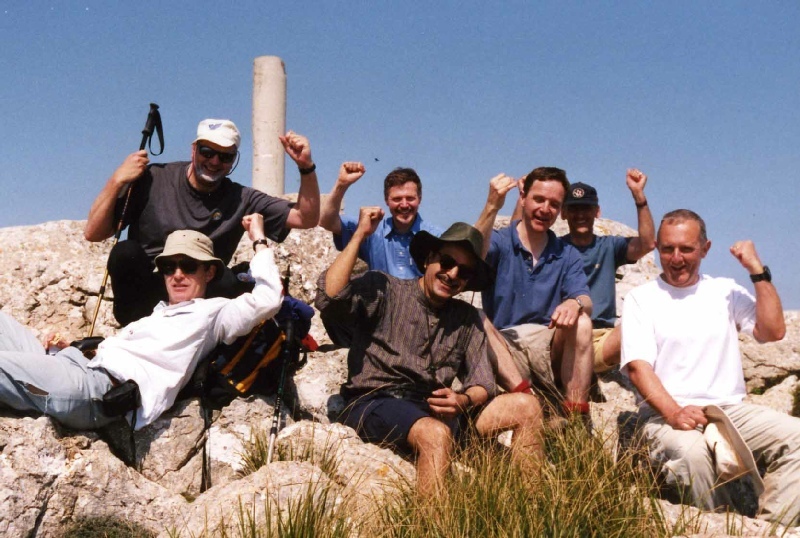 Trip members were Bruce, Mark, Anoosh, Peter, Phil, Martin and David. After a taxi journey to Valldemossa from the Hotel in Soller, the walking started with a gentle ascent to the Font des Poll along some good tracks and paths. The path rose through the woodland to emerge very near the summit of Teix (1062m). 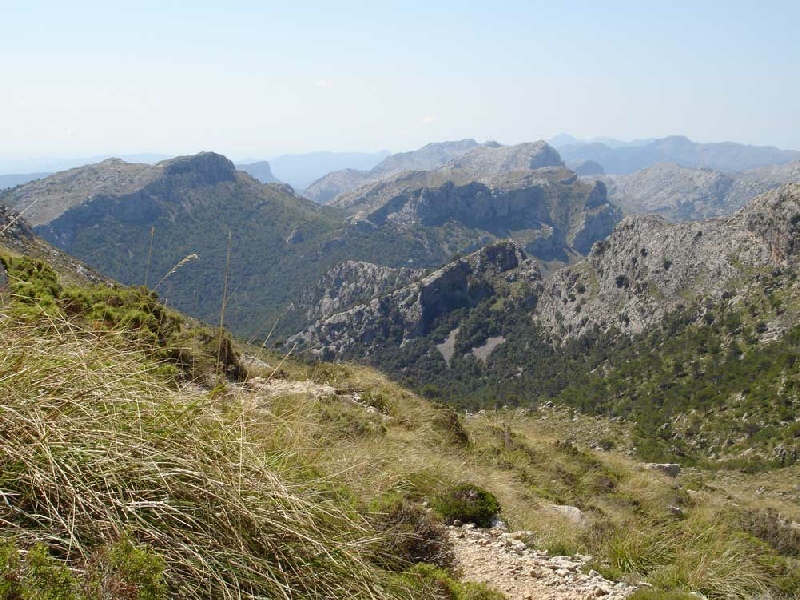 An easy descent lead to the Pla de Sa Serp plain and a slight rise to the Puig d'es Vent (1004m). With superb views of Puig Major and our next days walk ahead of us, we followed a ridge running to the top of Sa Galera. The descent to Soller began with an easy drop down to the col between Sa Galera and Puig Morro. After a slight detour we headed down the valley towards Soller via a confusing series of paths, eventually reaching the Porte Soller - Soller road and a well deserved glass of freshly squeezed orange juice. The road to the village of Biniaraix was a pleasant contrast to the rough limestone of the first day. The road leads through groves of orange, lemons, figs and nuts. The village is a postcard perfect Mediterranean village, each door and window surrounded by vines and bougainvillaea. 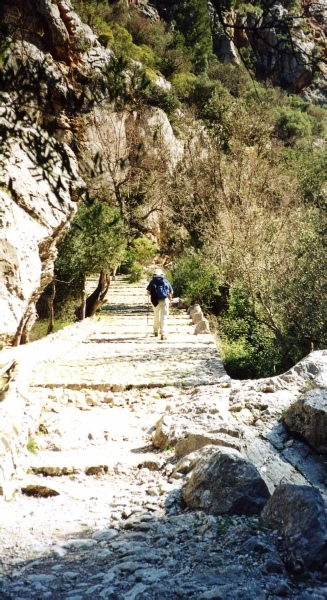 The route to the Barranc, a series of steps leading into the mountains, was well signposted. We were soon winding our way through wonderful terraces of olive trees into the ever narrowing valley below the sheer cliffs of the Cornadors. The peak of L'Ofra towered some 1100m above us. The many steps of the barranc were soon behind us as we approached the Cases de L'Ofra farm house and headed on towards the Coll de L'Ofra. At the Coll the country opened out with wide views to the Cuber reservoir below and Puig Major above. The track on the south of L'Ofra was taken and the way-marked route followed to the top of L'Ofre. From the top, a wonderful ridge walk lead over Puig Franquesa to Sa Rafeta. Striking views of Puig Major and the sugarloaf peaks of S'Alcadena and Alaro met us on the summit. 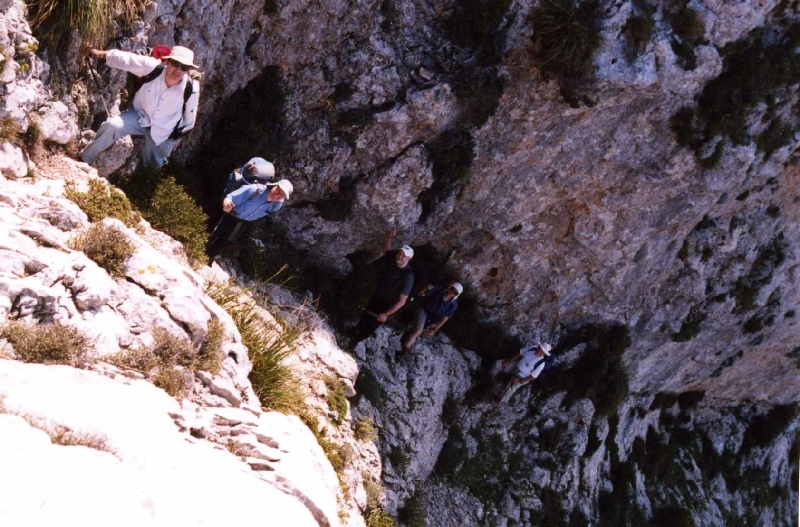 The descent of Sa Rafeta was tricky, with little evidence of a path or cairns to mark our way. After one or two diversions we eventually made it down to the Cuber dam. The path to Tossals Verd refuge is well marked and makes its way through a number of tunnels. Beware of farmers demanding Euros on the way to the hut! Chilled beers welcomed us to the Refuge, soon to be followed by an excellent meal of grilled meat, rough bread and home-grown vegetables prepared by the Warden. After a good nights rest, the path from the Refuge to the Coll des Coloms was taken. An hour of walking through Holm oak woods lead to the Font des Prat path and a welcome break to sample the delicious water at the spring. The ascent of Massanella, the highest accessible peak on the Island, was one the highlights of the walk. The peak was approached by continuing on the Coll des Prat path until facing the coll between Massanella and the Puig de Ses Bassetes. A rough pathless section through clumps of maqui and pampas grasses lead to the a rock wall several metres high. The scramble amused several members of the party but we all managed to gain the top of the coll with the help of trust in your boots then a good jug handle hold. 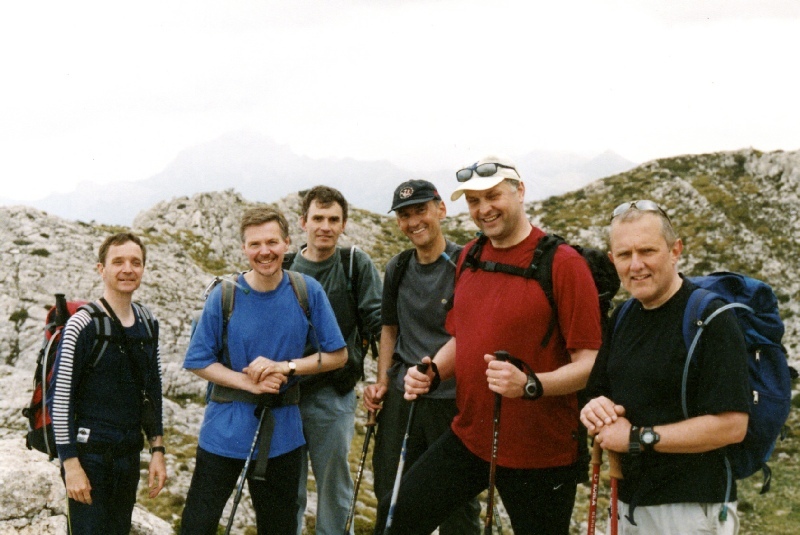 Once at the top of the scramble, no other difficulties stood in our way to the top of Massanella (1367m). From the top, the way marks were followed to the Font de S'Avenc and eventually through the woods of Comafreda to the road and Lluc Monastery. The Monastery is a wonderful place to stay, peaceful in the evenings after the tourist buses have left and the restaurant is great. After a good breakfast in the Monastery, the walk was resumed on the track to the Binifaldo water bottling plant. The steep ascent of Tomir (1103m) started straight away after the plant. The path is well marked and easy to follow even over the rough scree and scrambles. The summit was reached and one of the largest snow pits in Mallorca inspected. 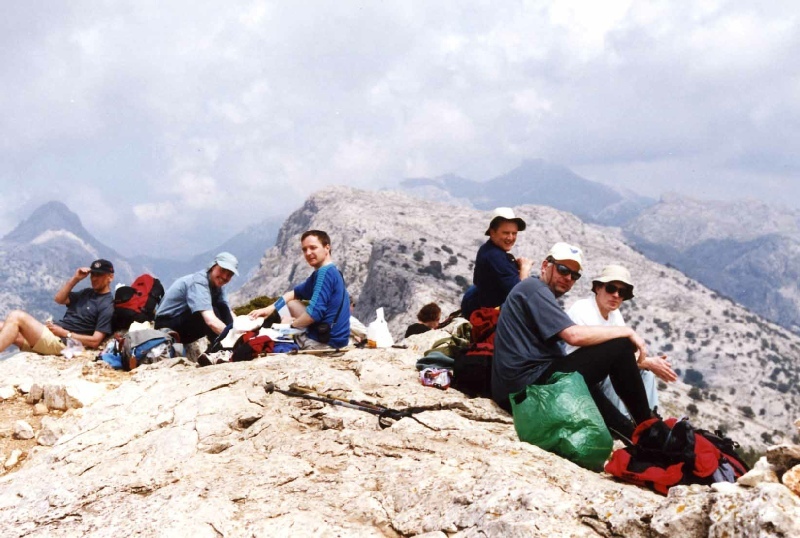 Refreshments at the top set us up for the descent to the coll between Tomir and Puig des Ca. A sloping ledge helped the way to the our last peak, the Puig de Ca (887m). At this point we were met by a close range fly past by the magnificent black vulture, the largest bird in Europe. After a rough descent to the Coll de Miner, tracks were followed to Fartaritx Gran farm. A mule track then lead to the Ca'n Huguet house and the wide track into Pollenca. We arrived at the main square in Pollenca, weary but in good spirits ready for the welcome refreshments in the square. Photographs were provided by a number of members of the party.